The ADC 5210 Standard 2.5v Diagnostic Set is a crucial addition to any physician's tool box. Compact, easy-to-use, full-featured, and lightweight, the set brings several commonly used instruments together in one portable case. 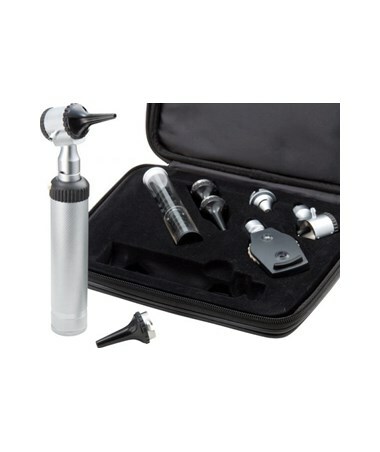 The set features two interchangeable heads: an ophthalmoscope head and an otoscope head. The ophthalmoscope head with lens wheel features 24 corrective lenses from –25 to +40 diopters for optimal resolution. It is fitted with a rubber brow rest to prevent eye injury and eyeglass scratches. 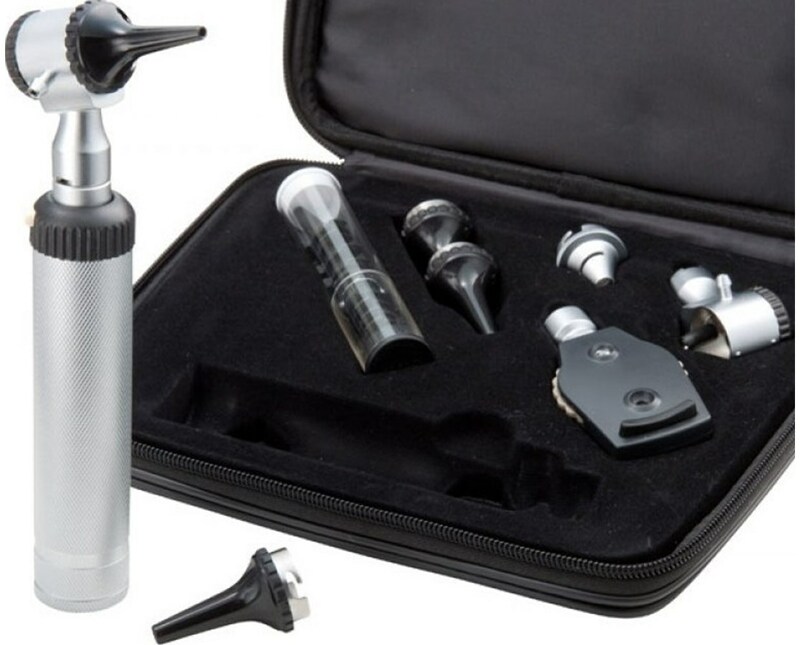 The otoscope head boasts a removable 4x magnifying lens and insufflator fitting for pneumatic otoscopy (insufflator not included). Both interchangeable heads click easily onto the C-cell battery-operated handle with the aid of bayonet head locking mounts for secure connections and simple changing. The handle also includes a convenient, ambidextrous rheostatic on/off switch. Your new ADC 5210 Standard Diagnostic Set comes complete with all necessary specula. The included Welch Allyn disposable polypropylene ear specula in 2.75mm and 4.25mm sizes are convenient, safe, and economical. Auto-clavable, polypropylene ear specula in 2.5mm, 3.5mm, and 4.5mm sizes are in the box as well, and the included adapter allows for use with Welch Allyn and other compatible disposable specula. This set is complete yet easy to carry and compact. It arrives in a scuff-and-scratch-resistant, easy-clean zippered case with fitted foam insert to keep instruments secure. It weighs only 1.25 pounds (20 oz) and measures 10.44"x 8.38"x 2.63". The ADC 5210 Standard Diagnostic Set will prove itself to be an invaluable asset to any physician. Its comfort and ease of use, small and lightweight size, and many features make it the perfect choice for regular use.